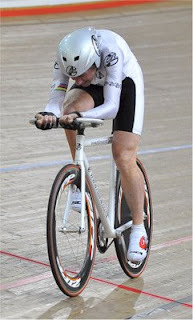 Jeff's Bike Blog: Garry Humpherson smashes world record again. Garry Humpherson smashes world record again. Wellington cyclist Garry Humpherson has just won his 2nd 70+ world pursuit title and smashed the world record in the process by over 8 seconds. Garry beat his own personal best of 2:40:892 in qualifying on wednesday morning with a time of 2:36:85 . It would have been a very emotional ride for Garry whose mother passed away a few days before he left to go to Aussie. Last year Garry was unable to claim world-record holder status for his time, because he was unable to afford the drugs test. This year Garry has been helped out with financial assistance from the PNP Cycling Club and John Wilson from NZline who subsidised Garry's trip to Aussie and also set him up with a very flash new Alan track bike and skinsuit. Another link to some of Garry's TT palmares. A link to the TV3 article on Garry before he left to go to Australia. Archival video links to Garry's race from the Masters World Champs track racing website. Results from Masters World Champs track racing website. Wednesday, 15 October 2008 9:00 AM. Wow! What a hero. Great going Garry!